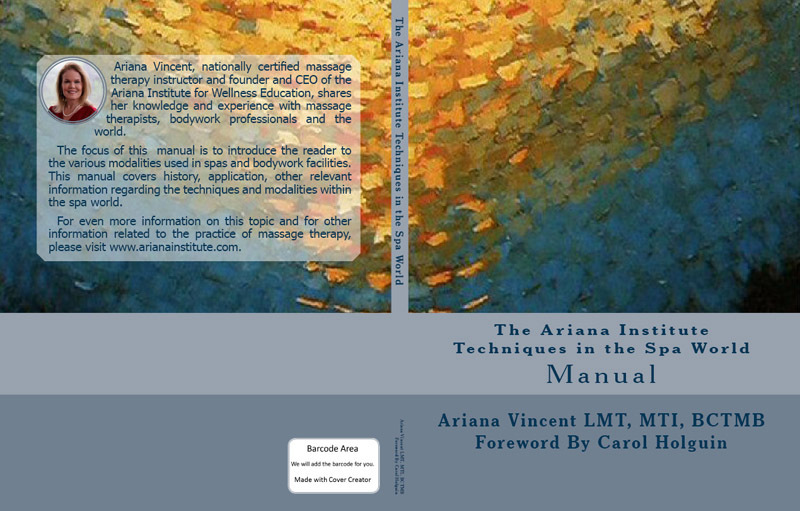 The Ariana Institute for Wellness Education is incredibly excited to present a new edition of the Ariana Institute’s Techniques in the Spa World Manual. This manual is part of a series of massage manuals that are designed to help deepen the knowledge and understanding of current massage therapists and introduce new, upcoming massage therapists to the world of massage and bodywork. The Spa World Manual incorporates detailed protocol descriptions, high definition instructional photos, links to the Ariana Institute’s online instructional videos demonstrating spa techniques, marketing and practice building strategies, and resources for advanced learning to encourage a comprehensive understanding of massage modalities that can be offered in a spa environment. This manual is perfect for spa professionals, spa owners, and massage therapy students as a source of deep study to further cultivate and expand their practices. It is also valuable for people who are interested in visiting spas and learning more about services offered. The Ariana Institute’s video introduction to the Spa Techniques CE course can be accessed on the Ariana Institute’s YouTube Channel at https://www.youtube.com/watch?v=OfKtHabQXBo. Thank you for sharing our excitement in these new developments for the Ariana Institute – we look forward to continue sharing our passion and knowledge with you. Ariana Vincent is a Nationally Certified Massage Therapy Instructor whose classes are accepted throughout the United States. She was awarded the 2015 CE Provider of the Year Award by the Alliance for Massage Therapy Education. Ariana is a Massage Therapy Hall of Fame Honoree and the author of 7 massage manuals available on Amazon. Here is the foreword for the Ariana Institute’s Techniques in the Spa World Manual, Second Edition by Carol Holguin, MC, CMT. When Ariana asked me to write the foreword for this manual, I was thrilled! I first met Ariana eight years ago, when I interviewed her for a massage therapist position at Spa Django at the Hyatt Regency Lost Pines. As a massage therapist myself, I am very particular when it comes to hiring therapists. Ariana surpassed every expectation I had of the ideal practitioner. She was highly skilled in numerous modalities and confident in her ability to provide excellent service in a timely manner. Her presence was calm and welcoming, and she understood the challenges of working in a busy spa. And when I felt her massage, wow! I hired her that day and we enjoyed working together for several months before I transferred to another of Hyatt’s resort spa properties. In addition to our time at Spa Django, I have also had the opportunity of utilizing Ariana’s educational resources. I contacted the Ariana Institute a few years ago, as I was a spa director looking for a way to offer relevant training to my therapists that would fulfill their required continuing education hours. The Spa World and Body Wraps course was the answer to that call. One of the challenges facing both therapists and spa management is the therapists’ time away from work to fulfill on-going training for licensure. Another is encouraging self-care and proper body mechanics to keep massage therapists healthy. The Spa World and Body Wraps course, and the Ariana Institute’s other courses meet licensing requirements for continuing education and can be completed online, allowing the therapist to continue to work while furthering his/her training. Her section on self-care is especially helpful. Ariana also offers on-location training, for hands-on skill development. For the massage therapist outside of the classroom, Techniques in the Spa World offers detailed guidelines to expand your skill set with spa-specific techniques. She includes treatment protocols, resources to enhance your study, and links to videos of many of the treatments. The material is both comprehensive and well organized. This manual will prepare you for employment within a spa, or can enhance your knowledge and technique if you are already employed in a spa environment. If you are in private practice, it allows you to confidently offer spa treatments to your clients. Techniques in the Spa World, along with the Ariana Institute’s Spa World and Body Wraps course, reflect Ariana’s extensive knowledge and experience, both in the spa environment and in massage and bodywork. These are invaluable tools for spa directors and spa management personnel, especially for those not trained in the service end of spa offerings. Ariana offers detailed descriptions, step-by-step protocols, benefits and contraindications, and links to her beautiful high definition videos. It gives a comprehensive understanding of the service provider perspective. This manual is a great resource for the spa management library, while the course offers a mindful, organized, and comprehensive journey. Enjoy! To order your copies of the Ariana Institute’s Techniques in the Spa World Manual visit www.amazon.com/author/arianavincent. For additional information about the Ariana Institute and to register for online CE courses visit www.arianainstitute.com/ce-online/.